It is quite annoying to deal with "Send Error Report to Microsoft" message every time an application crashes. The same dialog box appears even when the operating system recovers itself from some serious/critical errors. Sending error reports is one of the most important things you can do for the health of your computer. The more error reports Microsoft receives for a particular problem, the more likely it is the problem will be fixed. However, if you've got a problem that keeps appearing and you'd rather get rid of this error message appearing, you can turn off error reporting so it doesn't prompt you anymore by following simple steps given below. On the Advanced tab, click Error Reporting. Click Disable error reporting and clear the But notify me when critical errors occur check box, as shown in Figure. Temporary Internet Files clutter your hard drive with copies of each page visited. Files can build up over time and take up lot of disk space. Even more bothersome is that, IE (Internet Explorer) often takes a page out of the Temporary Internet Files, instead of getting new pages each time. This can be a problem if you are viewing a website that is updated all the time. This can be good if you are on a slow connection such as a 56K or lower. But if you are on a fast broadband connection, then you can easily reduce the size of your Temporary Internet Files to just 1MB without affecting overall performance. The PDF Edition of Ubuntu Pocket Guide and Reference is available completely free of charge. It's presented by UbuntuPocketGuide.com It is practically identical to the Print Edition. You can download it by clicking the links below. Over 100,000 people already have this copy. With this Firefox Addon, you can share text between computers. You can copy and paste text between computers simply with ctrl+c and ctrl+v. This addon lets you copy text instantly between Mac, Windows, and Linux. It is perfect if you use two computers side by side. The Copy and Paste Addon works between computers when Firefox is running with ctrl+c and ctrl+v (cmd+c and cmd+v on Mac). This add-on shares your text clipboard between computers so you can copy and paste text between computers instantly, even from a Mac to a PC. 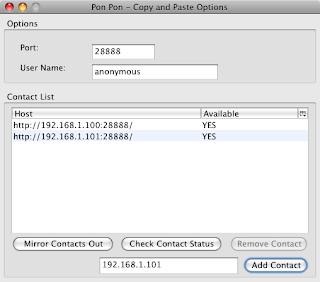 To set up Copy And Paste, add desired computers IP Addresses to the Copy And Paste Preferences in the Firefox menubar at Firefox->Tools->PonPon - Copy And Paste. Ensure that Firefox is running on the local and remote computers when trying to share text. Please note that this addon works only for texts, you cannot copy and paste images. Today GMail is starting to roll out an experimental feature in Gmail Labs: Offline Gmail. Now even if you're offline, you can open your web browser, go to gmail.com, and get to your mail just like you're used to. Now GMail has overcome these gaps. Once you turn on this feature, Gmail uses Gears to download a local cache of your mail. As long as you're connected to the network, that cache is synchronized with Gmail's servers. When you lose your connection, Gmail automatically switches to offline mode, and uses the data stored on your computer's hard drive instead of the information sent across the network. You can read messages, star and label them, and do all of the things you're used to doing while reading your webmail online. Any messages you send while offline will be placed in your outbox and automatically sent the next time Gmail detects a connection. After your browser reloads, you'll see a new "Offline0.1" link in the upper righthand corner of your account, next to your username. Click this link to start the offline set up process and download Gears if you don't already have it. Feedity lets you create free RSS Feeds for any webpage. Suppose you're visiting a webpage and you wish to subscribe to that page but a page doesn't provide you with an RSS link to subscribe - in a situation like this, Feedity helps you subscribe to that page very easily. All you have to do is to copy and paste the link/URL of the page you wish to subscribe to, in your Feedity account and they give you the link of RSS Feed of that page. Some of the ready examples are also given in the homepage. Lets say, you wish to subscribe to YouTube Top Rated Videos Today, simply select the option and press Privew button as shown below. US President Barack Obama is making an Optimum use of Internet. First he started addressing people through videos on YouTube every week. It's also in the news that he's the first US President to start his own blog. Now Obama is going to launch a site where common people can see details on how and where US Government spends TaxPayers' Dollars. Obama mentioned the same in his Jan 24, 09 weekly address on YouTube. The domain is already taken and the advertisement for the same is posted on it's homepage. It's name is 'Recovery.gov'. It seems the site is going to be active after the passage of the American Recovery and Reinvestment Act, as mentioned there. An oversight board will routinely update this site as part of an unprecedented effort to root out waste, inefficiency, and unnecessary spending in American Government.